Your anchor might save your life and your yacht! Honestly, every boat should have an anchor onboard and it should be ready to use at all times. Not so long ago, I received a Mayday. 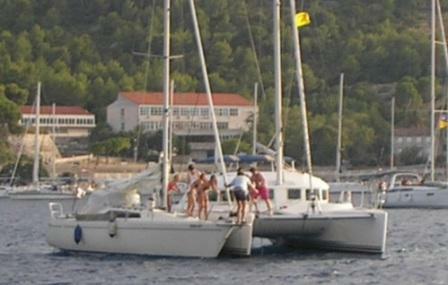 A sailing yacht got into trouble when a strong frontal disturbance passed over us. The engine refused to start and the man couldn't control the mainsail anymore. It was hectic! The man was blown towards the rocks of a nearby island, so his only rescue was to drop the anchor and hope that the anchor dug itself in before he hit the rocks! Luckily the coast guard came to help him, but the anchor would have been his last hope to save him, if they didn't reach him in time! This one drives me crazy! Anchors and chain are heavy pieces of equipment and so, they are a pain to separate them. This summer, at 3 a.m., so when I was far, far away in Dreamland, I heard an engine very close to our bow. I jumped out of my bed, to see that a sailing yacht was beam on our bow. Luckily the other yacht reversed away from the bow, but their anchor got stuck on ours. The best way to handle this is to stay calm and get busy to separate anchors. It's not a good idea to postpone this work, because when you raft together, you both risk damage when the wind would pick up and you are restricted in your movement. Also, you're not sure anymore if your anchor is still well dug in. Now, when we were getting the anchor in, an anchor knot the size of a basket ball appeared above the surface. This takes us to our next point. 8) Guard your anchorage spot! You have to do this! You do yourself and your candidate-neighbour a big favour! Anchoring a boat on or nearby somebody's anchor is not a good idea. It brings misery! There is nothing wrong to let the other boat know where your anchor is or to ask him to re-anchor if he is too close. If you don't, you risk a fouled anchor or you risk to touch each other when boats are swinging around their anchors. I always say or ask this politely. This is also good seamanship! When you're at anchor, you have to show the appropriate signs or lights. 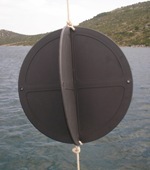 This means, in daylight, you show the anchor ball on your bow, and you switch on the anchor light at night. With this, it is clear for other boats that you're at anchor and that they have to go round you! In case of a collision, the insurance will want to know if you were showing the sign or light. Husband drives the boat and the wife is on the bow. They go to their preferred anchorage spot, but the wind is a bit of a hassle. It blows like crazy and the woman gives the husband directions, while she's looking forwards. Husband: "What? I can't hear you!" Wife: "I said (while turning her head again forwards) ..."
Honestly, who hasn't been in this situation. You scream like crazy and you're completely frustrated. Not a happy boat! Now, this also counts when parking the boat and other manoeuvres, you can get yourself a captain - mate communication system. We use it and it's great. I've seen cruising couples use it on 36 foot boats and bigger. The benefit are: no screaming anymore, it looks like you know what you're doing, efficient communication and you're having a happy boat!